This recipe is free from eggs, dairy, gluten and nuts. Cheese scones are great with tomato soup! Pre-heat oven to 180°C. Line a large baking tray with baking paper. Sift flour into a large bowl, and then rub in the margarine until it resembles bread crumbs. Add the soy cheese and stir through. Pour in the milk and mix until just combined. Do not over mix or the scones will not rise. Using a dessert spoon, drop heaped spoonfuls of mixture onto prepared tray. 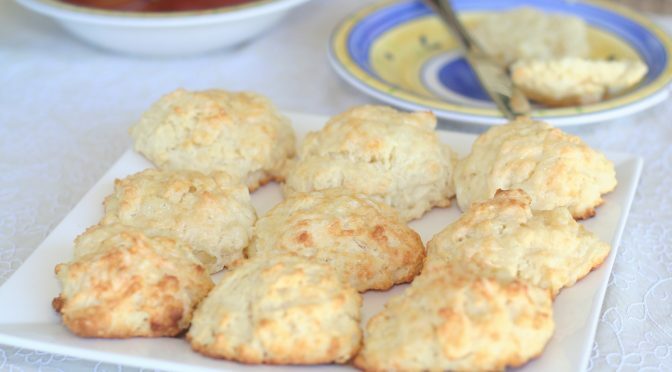 Leave room between each scone for them to grow a little during cooking. Sprinkle a little extra cheese onto the top of each scone. Bake for 15 minutes or until golden. Previous PostChilli and Rosemary Drop SconesNext PostIs the texture of food any different using soy or rice milk?